Chef Rebecca Charles spent a lot of time in Maine when she was growing up and is finally fulfilling her dream of opening a restaurant in the Kennebunks. Charles, a native New Yorker, was the first to bring Lobster Rolls to NYC when she opened the Pearl Oyster Bar in Greenwich Village in July, 1997. She introduced one of her Maine loves to the city! Charles purchased the building that used to be Abbondante at 27 Western Avenue in Kennebunk’s Lower Village, a space that she’s had her eye on for years. After applying multiple coats of paint to cover the black walls, she has transformed the upper level of this building into a light and airy restaurant space that is now Pearl. She has maintained a couple of the key features of this building. The huge fireplace is still burning wood on one wall and the long pine table still runs down the middle of the restaurant floor. It’s a great space for larger parties to dine at. They are currently serving lunch on Friday and Saturday’s and dinner Wednesday through Sunday evenings. There is a full bar service in the restaurant as well as a good selection of beers and wine to choose from. The menu does lean towards seafood, as you would expect, and has a nice mix of small plates and larger entree’s. 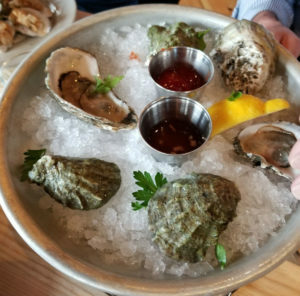 Oysters on the half shell, clams and steamers are all on offer. Their New England Clam Chowder with smoky bacon is amazing and perfect with the lobster roll as lunch or dinner. The Caesar salad is light and fresh. We also tried the heirloom tomatoes with Burrata and olive oil as an appetizer. Yummy! What impressed us about the food was that it wasn’t fussy. Just fresh, tasty and simply prepared and served. For the main course, Roger tried the Bouillabaisse which was served with a big chunk of lobster, scallops, shrimp, clams and mussels. A seafood smorgasbord! You can also get a boiled or grilled lobster, the lobster roll or a fried oyster roll. If seafood isn’t your thing, they’ve got plenty to choose from. Teri had a ribeye steak that was served with shoestring fries. It was cooked perfectly, tender and well seasoned. They also have a pan-fried chicken and roast loin of pork on the menu to choose from. Now that Pearl is up and running, Charles is turning her attention to getting the Spat (a baby oyster) Oyster Bar set up in the basement of the restaurant. She is intending to keep this small intimate setting open year around as a perfect place to stop in for oysters and a beer. Charles is planning to keep her flagship New York restaurant open and has hired chefs local to Kennebunkport to keep things going here when she has to be in New York. We’re glad to have Pearl and Spat as new restaurant additions to our area! For reservations, call (207) 204-0860.